Picture our national parks, and you may well conjure up images from some of our country’s most iconic natural wonders: the spectacle of Yellowstone’s Old Faithful, the impossible spires of the Grand Tetons, the pointed firs and rocky shores of Acadia, the fall foliage shining along the winding Blue Ridge Parkway. Ask your Senators to cosponsor and support the Restore Our Parks Act (S. 3172)—a bill that provides dedicated funding to address the deferred maintenance backlog. What may not readily come to mind is the historic infrastructure that enhances these extraordinary places—the trails, lodges, cabins, armories, archaeological sites, cultural landscapes, memorials, and more that help visitors access and understand the parks while providing tangible links to the human experience. There are also a vast number of park units that preserve and interpret sites where vital chapters in our nation’s history played out: Little Rock Central High School National Historic Site, where desegregation began in the volatile days following the Brown v. Board of Education decision; the Seneca Falls, New York, convention hall where major steps towards women’s suffrage took place; the birthplace of the Wright Brothers’ aviation dreams; and so on. The National Trust for Historic Preservation has long worked closely with the National Park Service (NPS) to champion these places as essential and irreplaceable contributors to our economy and our heritage, to be cherished and protected and passed down to the generations that follow. Recently, coinciding with the National Park Service Centennial, a major priority of our work has involved partnering with the Pew Charitable Trusts to shed light on the threat posed to this rich heritage by addressing one of the largest issues facing our national parks today: deferred maintenance. After 100 years of use and decades of inconsistent public funding, the National Park System faces a deferred maintenance backlog of $11.6 billion—47 percent of which is estimated to affect historic assets. Funds have simply not been allocated by Congress in such a way as to enable the NPS to restore and maintain its 417 parks and sites, which have been visited by over 330 million people last year. This reality puts these natural, historic, and cultural sites at risk of permanent damage or loss. For as long as it endures, the price tag and the damage will continue to grow. The stories of the three parks below illustrate the range of ways this issue impacts visitors’ experiences and the future survival of these key resources. A great kiva in the Chaco Culture National Historic Park. Designated a UNESCO World Heritage Site in 1987, New Mexico’s Chaco Culture National Historical Park (NHP) is home to approximately 4,000 prehistoric and historic archaeological sites that take the visitor through 10,000 years of human history. The canyon was once the setting of a flourishing ancestral Puebloan community, and a thriving commercial and political center. Visitors wind along roads and trails to view pre-Columbian petroglyphs and detailed rock art. They step through the remains of sophisticated pueblo structures and ceremonial kivas to observe the incredible architectural, engineering, and astronomical acumen of the ancestral Pueblo peoples up close. 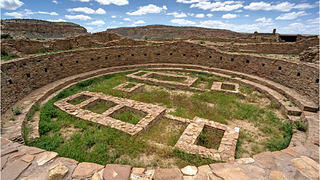 Unfortunately, despite being recognized as an exceptional international treasure sacred to the identity and culture of Native Americans, as well as the densest concentration of pueblos in the American Southwest, Chaco Culture NHP is also the site of an almost $17 million deferred maintenance backlog. Many of the archeological sites face structural issues and must be shored up with support beams, presenting a safety hazard and a visual intrusion to the visitor. Erosion and foot traffic has also rendered underground water pipes a visible eyesore. The park’s 150 archaeological structures must be routinely maintained every 2-3 years to remain stable, while the staffing and resources needed to execute these repairs has been reduced over time. Visitors to Atlanta’s Sweet Auburn neighborhood experience places that were significant in Dr. King’s life, namely the block of houses that include his birth home and the Historic Ebenezer Baptist Church, where Dr. King was baptized and ordained as a minister. The Southern Christian Leadership Conference took shape at Historic Ebenezer Baptist Church, and it was the location of Dr. King’s funeral. As they visit the church, guests will also observe the effects of over $13 million in deferred maintenance costs that mar the interpretation of the life and legacy of Dr. King. Water seepage around the windows and into the church’s masonry, for example, has produced cracks, peeling plaster, and buckling wood floors inside an otherwise gorgeous place of worship. 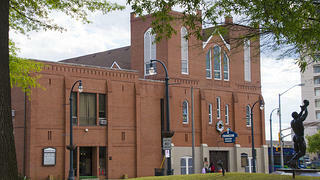 Historic Ebenezer Baptist Church, part of the Martin Luther King, Jr. National Historical Park in Sweet Auburn, Atlanta. Harpers Ferry is a small town nestled between the confluence of the Potomac and Shenandoah Rivers in West Virginia. It was also the site of a major revolt against slavery in 1859 and, a few years later, the largest surrender of federal troops during the Civil War. Hundreds of thousands of visitors are drawn to the park to explore its battlefields and enjoy sweeping mountainous views, rafting, hiking, and quaint streets. Unfortunately, the park’s historic structures are not all so picturesque. Together, they suffer from almost $8 million in deferred maintenance. The 1848 Lockwood House, for example, served many roles during the Civil War, including a hospital that treated Union soldiers during the Battle of Harpers Ferry in September 1862. Brig. Gen. Henry Lockwood, for whom the house is named, and Maj. Gen. Philip Sheridan used the building as their headquarters. Shortly after the war, it was converted into Storer College, a school for the newly freed enslaved community. Yet despite its fascinating history, the building is now closed to the public and is unsuitable for occupancy, given its unsafe hallways, extensive water damage, and decaying plaster walls. Stories like this abound from all corners of the park system and involve all aspects of the visitor experience—from the closure of a popular hiking trail at Zion National Park, to the lack of a consistent source of clean drinking water at Grand Canyon National Park, to the collapse of a historic cabin at Voyageurs National Park in northern Minnesota. Given the magnitude and multi-faceted aspects of the park system’s maintenance backlog, our parks are in need of creative yet practical policy and funding solutions. The 1922 Quapaw Bathhouse in Arkansas' Hot Springs National Park. Boosting volunteerism at our national parks, particularly where it can also serve to draw young people and those from underserved communities into the parks, could help address the issue of deferred maintenance. One such program is the National Trust’s HOPE Crew (Hands-On Preservation Experience) initiative, which trains young adults in preservation skills while helping to maintain and restore historic sites in parks and other federal lands. In the first four years of the program, HOPE Crew corps have logged 120,000 hours on over 150 projects, helping to support $18 million in historic preservation work. These projects have restored dignity to national cemeteries at Jean Lafitte National Historical Park in New Orleans, horse stables at Shenandoah National Park, and the former historic artist studio that now serves as a visitor center in Grand Teton National Park, among many others. Leasing historic buildings in America’s national parks has also shown promising results. This arrangement alleviates the burden on NPS to maintain certain historic buildings and brings new amenities and revenue to the parks themselves. At Valley Forge National Historical Park, for example, a Montessori school operates within a formerly vacant building, bringing new energy and revenue to the park while providing its students and teachers with a fascinating educational experience just outside its doors. 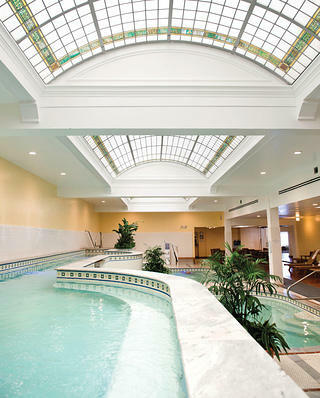 Other examples include the Argonaut Hotel in a rehabbed fish cannery and warehouse in the San Francisco Maritime National Historical Park, and the Quapaw Bathhouse in Arkansas’ Hot Springs National Park, a 1922 Spanish Colonial-Revival structure that, after decades of vacancy, now houses a modern spa. Despite these solutions, the National Park Service needs expanded resources and favorable policy to properly maintain and repair places that preserve our nation’s history—its triumphs and its tragedies—for future generations. The National Trust is joining our partners in calling on Congress to provide dedicated annual federal funding to address the deferred maintenance backlog of the National Park Service.